The veneration of local heroes often says as much about the locals as about the heroes. Would Elvis be the King, for example, if Graceland were on Long Island? The matter of a cultural icon’s stature among the faithful occurred to me in prepping for a golf trip to the Costa Brava region, on the northeastern tip of Spain’s Iberian Peninsula. 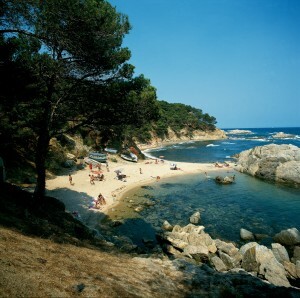 Part of the Catalonian province of Girona, which is also the name of the capital, the Costa Brava’s favorite son – Salvador Dalí, best-known of the Surrealist artists and writers – made me curious as to what a visit there would reveal. Wild-eyed, with an outrageous handlebar mustache and strange headgear, Dalí undeniably exuded the larger-than-life aura required of all heroes. The thing is, what exactly should one anticipate in the old stomping grounds of the creator of “Soft Self-Portrait with Grilled Bacon”? Thankfully, the answer proved simultaneously simple and otherworldly: Costa Brava is, as Monty Python might say, something completely different, especially when juxtaposed with, say, Andalucia’s Costa del Sol to the southwest, a more “touristy” destination much better known to Americans. Apart from year-round golf, there is snow skiing in the neighboring Pirineu de Girona, or Girona Pyrenees, in easy striking distance to the north, and sprawling beaches on the Mediterranean coast. Catalonia’s cultural traditions draw on Romanesque, Gothic, baroque, and modern influences, and many visitors from the Continent consider the area, coterminous with France directly to the north, the current epicenter of creative cuisine. “It would be difficult to find such a delightful coastline anywhere else in the world,” Dalí noted, “with this mineral and geological grandeur.” Even the atmosphere looks different, largely because of the region’s prevailing tramuntana winds, which also bend the indigenous cypress, plane, cork, and olive trees into intriguing shapes. The distinct Catalan dialect reinforces the sense of a world apart and, congruent with the exotic physical environment, the populace seems, entirely apropos of Dalí, avowedly iconoclast. In fact, his surpassingly vivid visual sense seemed to pervade our whirlwind tour, organized by the Spanish Tourist Board and the Golf Travel Company, based in Atlanta: So colossal is the range of activities that at some point I began to feel like one of the melting, dripping watches that constitute recurrent symbols in his work. Still, I can’t wait to return. Our arrival in Costa Brava reinforced golf’s preeminence as the ideal recreation – just vigorous enough but not exhausting — after a long travel day. 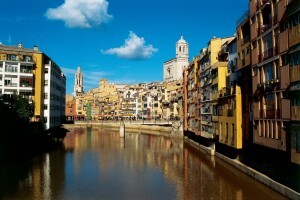 (Girona has an international airport serving certain European points of departure, but Americans will otherwise have to fly to Barcelona, the capital of Catalonian culture and history, approximately an hour’s drive from Girona.) And Empordá Golf (www.empordagolf.com) – tough enough, certainly, but not overwhelming — turned out to be an excellent place to start, though the region’s dozen or so pitch-and-putt courses would also be suitable candidates. First opened in 1990 and designed by globetrotting American Robert von Hagge, Empordá is a 27-hole complex with nine more holes to come, situated due east of Girona. Suggestive of a contemporary approach to spreading the game, its modern features include multiple sets of tees for a malleable challenge, a practice area with a range, chipping and bunker-play sections, an 18-hole putting green, and a golf school. The 18-hole combinations, the longest of which is just less than 6,800 yards, par 72, are designated Forest and Links. Employing a design palette typical of many courses in the area, the former has holes framed by huge, umbrella-like pine trees and cork oaks. The latter – just minutes from the coast but not technically linksland – has the dunes, sandy soil, and windswept, moguled terrain to simulate the links experience. Empordá is part of a sort of golf-tourism ecosystem that includes La Costa Golf & Beach Resort (www.lacostahotel.com), with 120 units, including 53 “golf apartments,” as well as Mas de Torrent (www.mastorrent.com), a lavishly restored Catalan masia, or farmhouse, originally dating to 1751. The main building houses 10 individually decorated units, discreetly complemented by 29 garden suites. It proved an elegant setting for our initial sampling of the local staple known as butifarra, a type of sausage, as well and dishes made with the area’s black rice and fresh anchovies. As is usually the case, the local cuisine goes well with wines distilled in the area, including whites, sparkling, roses, and red vintages. A favorite digestif is el cremat, which consists of coffee with burnt rum. 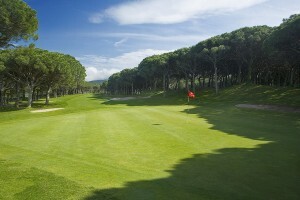 La Costa is also within walking distance of Golf Platja de Pals (www.golfplatjadepals.com), which is in turn within sniffing distance of the Mediterranean, though the 6,844-yard, par 73 layout plays like a parkland course. Designed by British architect F.G. Hawtree in 1966, it is the oldest of the Costa Brava’s 10 courses and opens with several short but extremely narrow holes circumscribed by towering, 100-year-old pines. The holes get progressively longer but more wide open – the 8th hole is 575 yards and the back nine has three par 5s – and both the topography and the hole-to-tee transitions are conducive to walking. Indeed, a good pair of walking shoes is de rigueur in the Costa Brava, least of all for golf, as our late-morning visit to nearby Peratallada exemplified. One of several restored medieval villages in the area, its name is a contraction for words meaning “carved rock,” in this case a palace and walls dating to the 11th century and surrounded by an incredible moat that seems chiseled from sheer granite. The urban grid is dominated by a central square, from which narrow spokes emanate toward residential streets, today occupied by restaurants and bars, shops, galleries, and small hotels. The region’s diverse appeal within a geographically discreet radius was once again highlighted during our lunch break on the Begur Coast, the easternmost point of the Iberian Peninsula. A craggy configuration of secluded blue-green coves and inlets, the beach communities feature all the available water sports, including scuba diving, snorkeling, kayaking, windsurfing, water-skiing, sailing, and deep-sea fishing. We dined al fresco at Hotel Aigua Blava (www.aiguablava.com), on Fornells Cove, a family-run establishment that caters to golfers. It has 85 units, many with terraces overlooking the beach, as well as three restaurants and three bars. 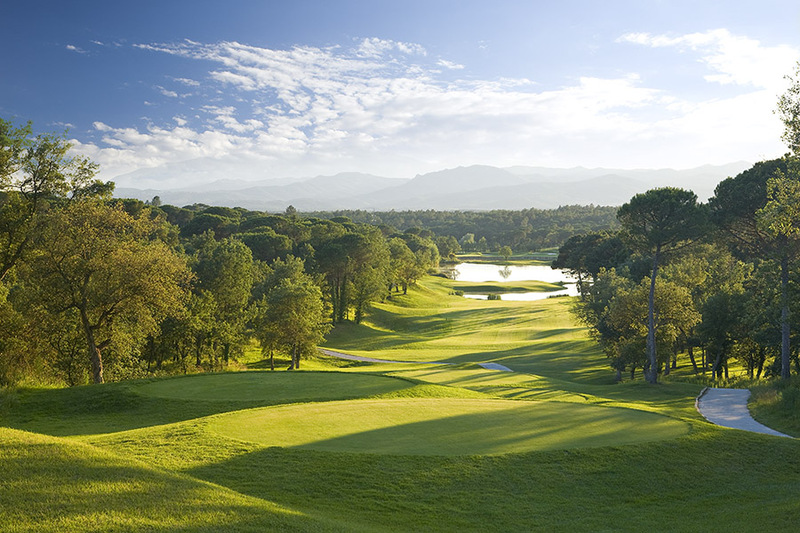 A half-hour commute brought us to PGA Golf de Catalunya (www.pgacatalunya.com), a strapping inland layout traversing a valley near the AP7, the major thoroughfare connecting Girona and Barcelona to the southwest. Designed by European Tour veterans Angel Gallardo and Neil Coles, it is a roller coaster ride, 7,247 yards, par 72, slope 138 from the farthest back of five sets of tees. Opened in 1999 and already the site of two professional tournaments and a standard presence on European best-of lists, plans are to add another 18-hole track, as well as a first-class hotel. All in all, the day seemed a microcosm of the Costa Brava’s extreme-opposite attractions – the natural versus the built environment. The countryside’s generally moderate contours make it especially popular among cyclists– Lance Armstrong has a place in the area and it is common to encounter clusters of riders on the roadways – and hikers. A number of the longer hiking paths bisect the entire province, from the coast to the Pyrenees; others hug the shoreline or the foothills. city with a wall. Other architectural treasures include the Monastery of Sant Pere de Galligants, San Nicolás Church, the Arab baths, and the stunningly preserved Jewish quarter. The immense cathedral stands next to the House of La Pia Almonya, a Gothic structure, as is the Chapter House, where the ornate Tapestry of the Creation is housed. Figueres, to the north, is a bustling town in its own right, as well as the birthplace of Dalí and site of the museum devoted to his work. Fittingly housed in a converted theater, Museu Dalí is as dramatic as its founder and adds well-rounded perspective to his prolific artistic career, much of which embraces more traditional forms of artistic expression, in contrast to his more sensational surrealist imagery. It seemed fitting to spend the final evening of our trip at the Hotel Plaça de Madremanya, a rehabilitated castle in the eponymous town just northwest of Girona. Folklore has it that the Costa Brava/Pirineu de Girona region resulted from the union of a shepherd and a siren, and our going-away repast perfectly captured the garlic-infused pairing of meat and seafood, particularly fowl and pork. Our only regret: the going-away part.